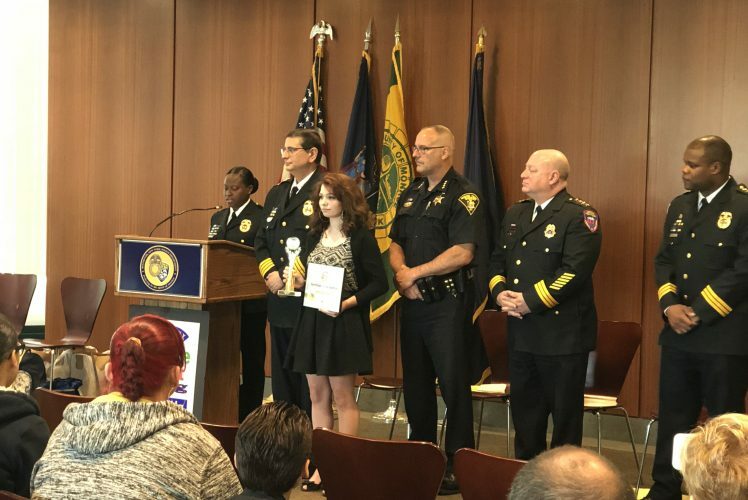 On Thursday, June 7, 2018, 11th grade Hope Hall Student, Cheyenne Miller was recognized for her outstanding citizenship and acts of kindness by the Monroe County and Rochester Police Department. Ms. Miller received a “Do The Right Thing Award” thanks to her bus driver of 3 years, Ms. Sara Gillard. Gillard nominated Ms. Miller because Cheyenne acts as a role model to her peers – she commends her peers when they act in a respectful, professional manner and will politely address bullying and unprofessional behavior with her classmates one-on-one. Cheyenne takes a firm stand against bullying and demonstrates daily acts of kindness towards others. Despite her personal struggles at home and in school, Cheyenne has transformed into an exemplary student and model citizen. We are very proud to have Cheyenne as a student and soon-to-be alumna in June 2019. Stay tuned to see Cheyenne accept her award on WHEC – Channel 10 News tonight.